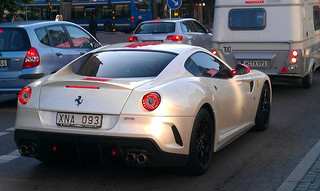 The 599 GTO sports car was introduced by Ferrari in 2010 and was, in fact, the road legal version of the 599XX racer. 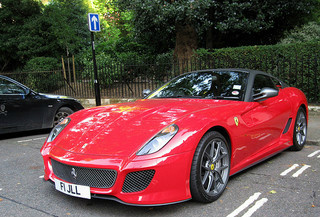 Furthermore, Ferrari claimed that the 599 GTO, priced at $450,000, was the fastest road car that the company had built to date. In line with existing nomenclature, "599" referred not only to its 5.999 litre engine, but also to the fact that production was limited to 599 units. The term GTO meant Gran Turismo Omologata, which referred to a Grand Tourer that had been approved for entry on the track. 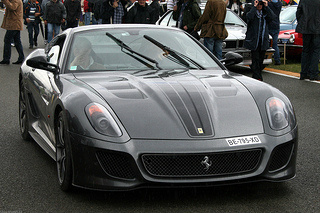 Furthermore, unlike earlier GTO models, Ferrari had no plans for the 599 to be used as a track racer. Weighing in at 1495kg, it was some 100 kg lighter than the standard 599 GTB, due in part to the use of thinner gauge aluminium in both the body and space frame chassis, as well as thinner glass in the windscreen. It was fitted with the latest system for monitoring the suspension, which worked in tandem with the most recent version of the F1 Trac, the traction control system. This meant that the rear wheel drive car reacted even quicker to the demands of the driver in respect of braking, using ABS, and cornering with the power-assisted steering. Interestingly, the braking capability of the car was such that it could stop from 62 mph in just 32 metres. There was a separate lower wing attached to the front splitter, which helped to increase the down force, and improve the flow of air to the oil-filled radiator. Under the car, there was a new, lower frontal area which contained diffusers positioned in front of the front wheels, and a new rear diffuser, both of which acted to maximise down force. As with the 599 GTB sports car, the Manettino system monitored both engine and braking to produce optimum delivery of power by the choice of either Race or Sport-mode. There was even a setting for the traction control to be switched off. The GTO was fitted with extended F1 paddles to facilitate high-speed gear changes, together with a unique system whereby the driver received visual data relating to the performance of the car at any moment. Fuel consumption in the city was 13 mpg. Based on the 599XX unit, and using its redesigned crankshaft, the 599 GTO sports car was powered by the same 6 litre, V12 engine as in the 599 GTB. However, the output had been increased, and it now developed 661 bhp at 8250 rpm, and 460 ft/lbs of torque at 6500 rpm. Linked to an F1-style six speed automatic gearbox, it produced a top speed of 208 mph, and a 0-62 mph time of 3.3 secs. With an aluminium head and block, the double overhead cam engine, with four valves per cylinder, used multi-point fuel injection, and a hefty compression ratio of 11.2:1. On the second hand market, one of the last Ferrari GTO sports cars built, and in excellent condition, was sold at auction of almost $480,000. This is another milestone from Ferrari.